Kamakura is a beach town filled with peaceful temples and gardens, adventurous hiking trails and gorgeous views from lush hilltops. We arrived on a Saturday morning and after having fantastic vegetarian burritos and tacos at a surfer inspired diner on one of the city’s main streets, we dropped our backpack off at our hostel, WeBase Kamakura, grabbed some snacks and sunglasses and headed on a hike through the city to Hasedera Temple. 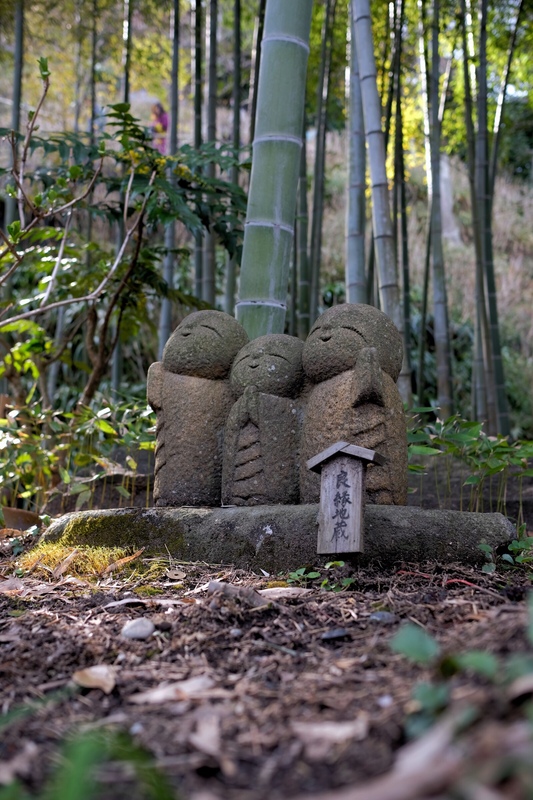 Nagomi Jizo statues at Hasedera Temple. Hasedera Temple, built in 736AD, is the oldest in the city and is very popular for its gorgeous gardens and 9 metre high statue of the eleven-faced Kannon Bodhisattva, carved from a camphor tree and painted gold. Both the statue and the temple are very impressive, and there is a deck and two sets of stairs you can climb to the left of the temple, that offer stunning views of the city and the surf rolling in from the ocean. Leaving a wish at Hasedera Temple. There’s a cave carved into the hillside that houses smaller statues and was super fun for Rowan, and most of the other kids visiting that day, because, well, it’s a cave … and they are the only ones who aren’t ducking their way through the entire time. 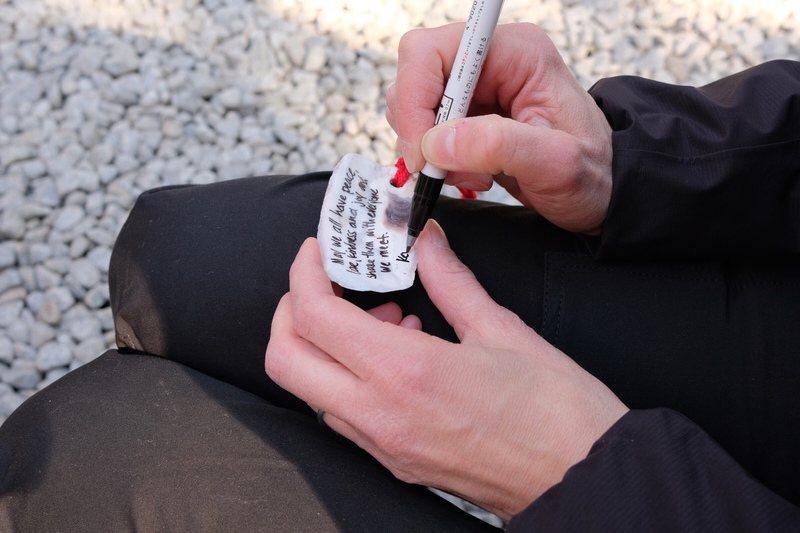 We also wrote a wish on the inside of an oyster shell and hung it among the hundreds of other similar messages lining a wall on the north side of the complex. 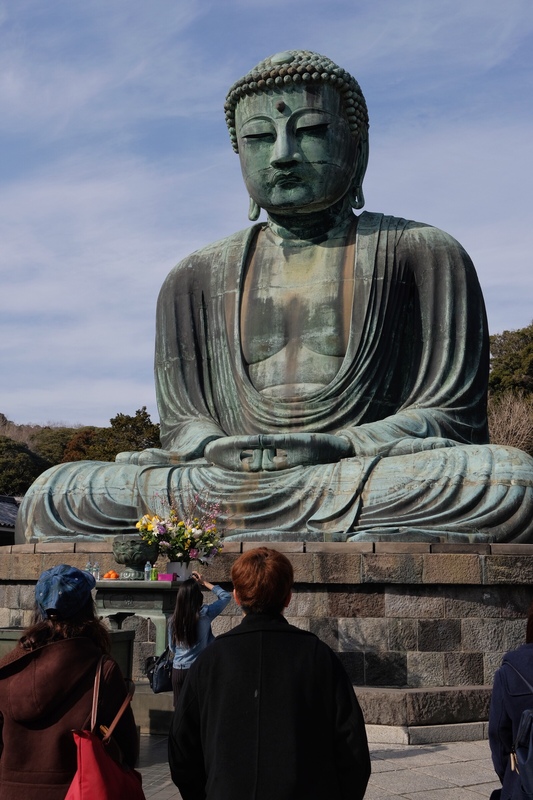 After Hasedera, we walked about 10 minutes north to see the Daibutsu, the Great Buddha of Kamakura. Cast in 1252, the statue is so immense, you can pay 10 yen (about 12 cents) per person, as we did, to climb into the statue along with dozens of other tourists and see how it was constructed. Known for its handsome face, the statue looks very peaceful, sitting in the open air, backed by a forested hillside and with cherry trees out front, which were just starting to blossom and attract endless selfies when we were there. Rowan disappearing up one of the many inclines along the Daibutsu Hiking Course. Next we stopped for an ice cream before beginning the Daibutsu Hiking Course which starts just north of the statue complex. The Course is an uphill battle at this point, with large tree roots to contend with, but it’s also very beautiful, with lots of tall trees and dense shrubs – and more than a few small squirrels. 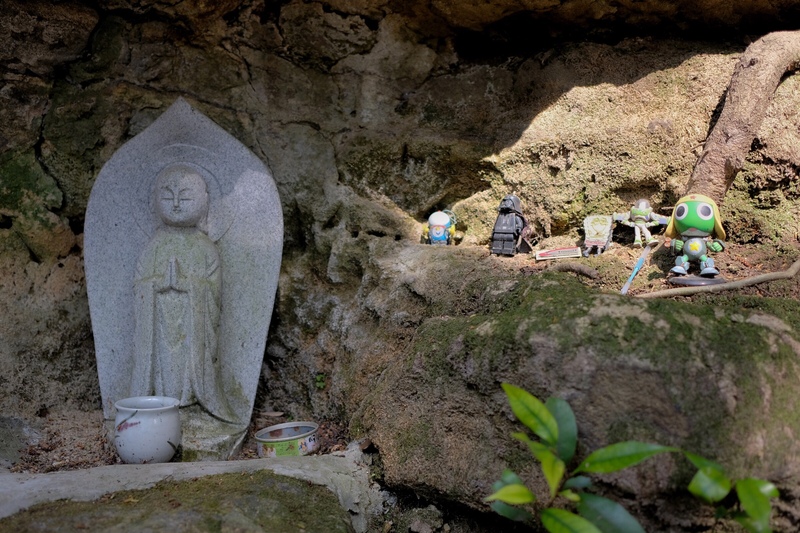 We hiked the Course for about an hour before ending at Zeniarai Benzaiten Ugafuku Shrine, where people come to wash money in the natural spring water for good luck. We liked sitting and listening to the temple’s waterfalls and were thankful for such a beautiful place to rest before the last leg of our journey back to the hostel. We had dinner at a vegan friendly restaurant on the beach, Magokoro, which offers hemp infused food and hemp products for sale. The meal was a highlight for our stay in Kamakura, with a beautiful set of 6 or 7 small dishes all served on one large plate, each different and unusual. We also loved listening to a great band practice before their set that evening, Delicious Grapefruits Moon, and although we couldn’t stay for the performance, we were happy to help the band with a donation – and we hope to download their first album, Ua a la. They were wonderful. 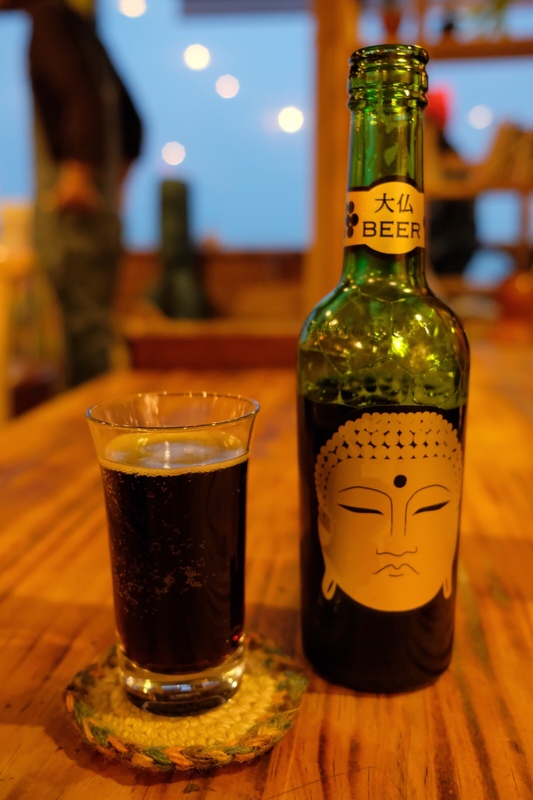 Enjoying a locally brewed Black Buddha Beer at Magokoro. 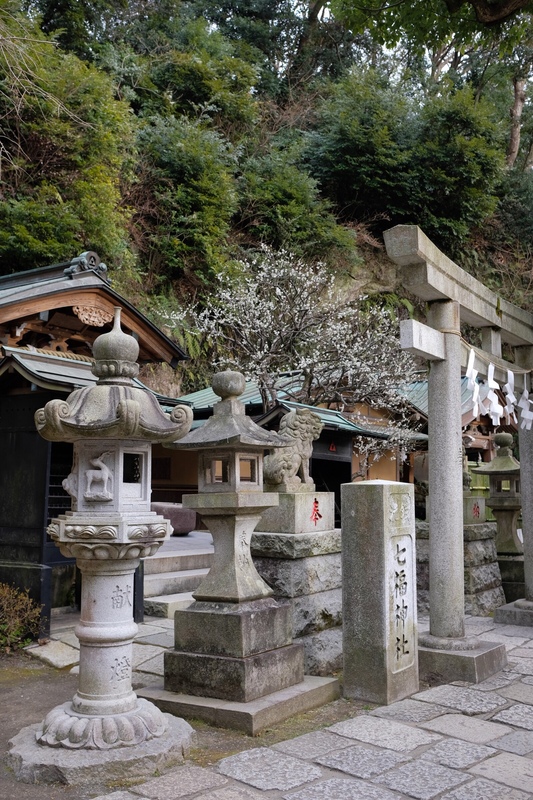 The next day, we took a 8-minute bus to Kamakura-gu, where we visited a small shrine before heading to Zuisen-ji temple, nestled into the top of a hillside. It has lovely gardens, and curious caves carved into the rock at the back of the complex, including bridges and stairs for access, though they were closed to tourists. 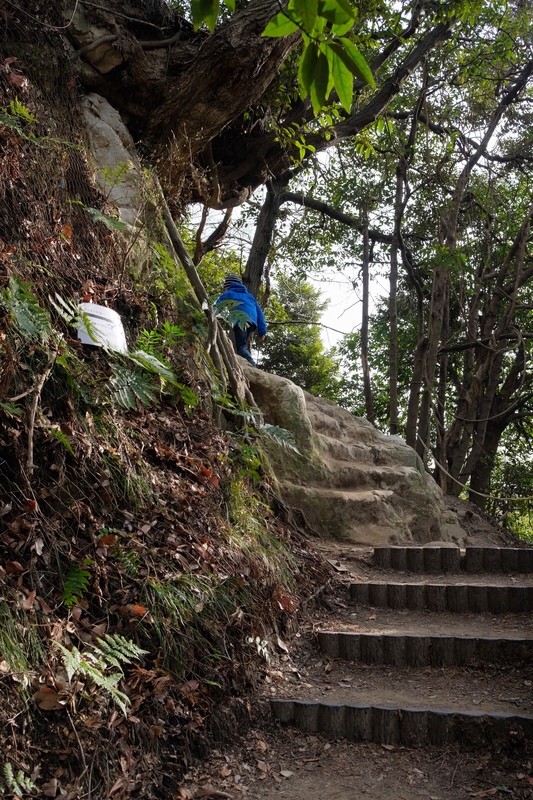 Then we joined the Tenen Hiking Trail, where we walked for 2 km, mostly uphill, before heading back down through gorgeous ferns and shrubs, tall thin trees and a glistening stream, to come back to the shrine at a Kamakura-gu. Some markers along the Tenen Hiking Trail. Next we visited Hokokuji temple, where in addition to a beautiful temple and garden, there is a small bamboo grove, with impossibly tall bamboo trees and a thin path that meanders through them. We walked behind three young women dressed as geishas, who were incredibly beautiful and giggly. 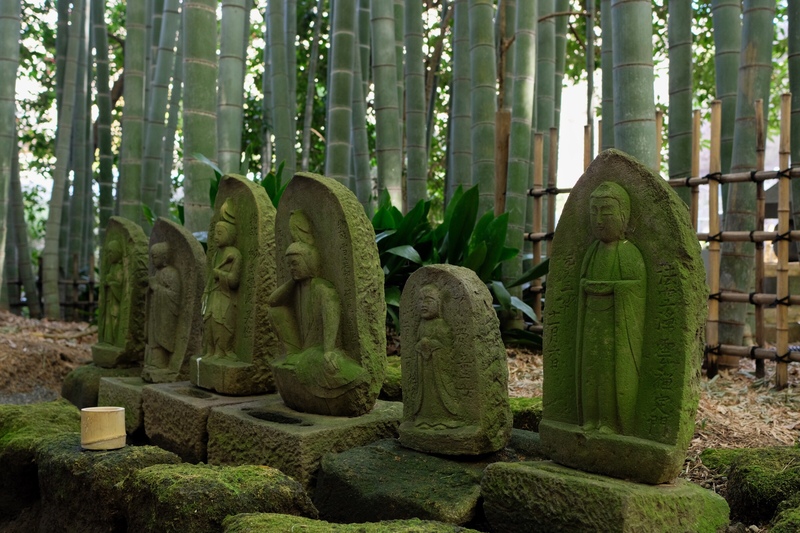 Buddha statues among the bamboo forest at Hokokuji Temple. After hours of hiking and temple viewing we headed back to Copen Local Base Kamakura for more burritos and beer before catching the late afternoon train back to Tokyo. And just like locals, Rowan and I dozed as the train swayed along the tracks, warmed by the setting sun, with views of Mount Fuji dancing through our dreams. Simply beautiful. Is it super hot there right now? The bamboo looks so lush. Do the crowds behave better there than they are usually in North America? I imagine them to be much more polite than they are here. Amazing pics! I feel like I’m there while reading your blog! Beautiful photos! Michael wants you to say hi to Rowan from him. Enjoy your trip! Mary, Rowan says Hi back! And see you soon! Eva, The weather is like early spring in Toronto right now in Japan. Some days are warm, sunny and 20 degrees; other days are cooler, more like 6 or 8 degrees and cloudy. Right now, it’s 1 degree at 6pm in Nagano, which is at higher elevation, so quite a lot cooler. The crowds everywhere we go are super polite, patient, and everyone is very respectful of personal space. No one really rushes, except the rush hour work crowd on the subway in Tokyo. Here in Nagano, everything is slower paced, quieter and far less populated, which is a nice change from the capital.